Along both banks of the lake and its backwater canals, coconut groves and palm trees interspersed with towns and villages are seen. 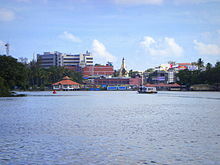 Kollam, (formerly Quilon) is an important historic port city located on the right bank of the lake. 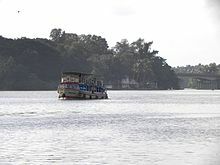 Boat cruises are operated by the Kollam Boat Club from Kollam to Alappuzha providing transport access to many other towns and villages along this route. Luxury houseboats also operate on the lake. The boat journey is an 8-hour trip, winding through lakes, canals and water bound villages. Chinese fishing nets, called cheena vala in Malayalam, are used by local fisherman and are a common sight along the waterway. The lake and the city of Kollam on its banks and the Neendakara port at the confluence offer a means of transport for the state’s trade and commerce in the cashew trading and processing industry as well as the marine products industry. The lake is the source of livelihood of many people living close by. Fishing, coconut husk retting for coir production and inland navigation services are the prominent businesses. In 2014,Clam Governing Council of Ashtamudi lake became the first Marine Stewardship Council certified fishery in India for their sustainable clam fishing. The lake and the life on its shores have inspired many artists and writers. It has been the subject of many poems by the renowned poet Thirunalloor Karunakaran who was born and brought up on its banks. Quilon or Kollam and inevitably the Ashtamudi lake's importance is claimed to be dated to the days of the Phoenicians and the Romans. 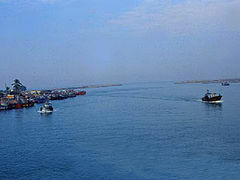 Ibn Batuta, during his 24-year sojourn in the 14th century, is reported to have mentioned about the Quilon port as one of the five ports for Chinese trade. Links with Persia (9th century), Chinese mandarin in 1275 AD, Portuguese in 1502 AD, and the Dutch followed British in 1795 AD are recorded history. Velu Thampi is credited with organizing the rebellion against the British from this place. 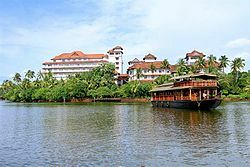 Considering Kollam as the entry city to the lake, access to the lake are to the Thiruvananthapuram International Airport, 71 km (44 mi) away and by road to almost all important centres in Kerala and the rest of the country. 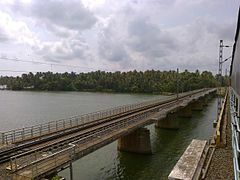 National Highway 47 (NH 47) passes through the lake periphery not only from Quilon but also to other locations on its bank from Thiruvananthapuram to the northern towns of Kerala. Southern Railways network of lines connects Quilon with all important centres in the rest of the country. 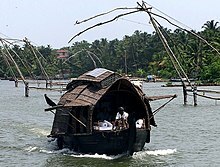 Ferry services operate daily to Alleppey and boats operate to all villages located in the canals of the backwater system. The boat jetty is located at about 2 km (1.2 mi) away from the railway station. Famous Paravur estuary and backwaters are just 21 kilometer away from Ashtamudi. 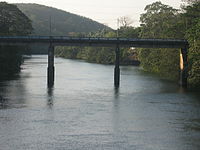 Kallada River is a major river discharging into the Ashtamudi Lake. 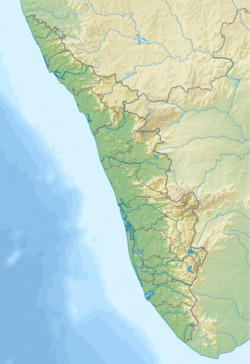 The Kallada river, which originates near Ponmudi from the Kulathupuzha hills Western Ghats is formed by the confluence of three rivers, viz., Kulathupuzha, Chenthurnipuzha, and Kalthuruthipuzha, and after traversing a distance of about 121 km (75 mi) through virgin forests finally debouches into the Ashtamudi wetland at Peringalam near Kollam. With a maximum depth of 21 ft (6.4 m) at the confluence, it is Kerala’s deepest estuary. Quaternary and Tertiary sediments and sedimentary rocks are the formations in the lake basin and environs. The Quaternary sediments are of marine and fluvial alluvium of recent age. Tertiary sediments comprise laterite, sandstones and clays of Warkalai formation. The average annual runoff from the river system into the estuary is reported to be 76 cubic kilometers of freshwater. The basin drainage area is 1,700 km2 (660 mi2) and with an average annual rainfall of 2400 mm (94 in) it discharges 3.375 km3 (2,740,000 ac·ft) of flow annually. It acts as a flood storage lake thus protecting the thickly populated city of Quilon (Kollam) and the coastal land. The Kallada dam built across the Kallada river is 85.3 m high by 35 m long (280 ft by 115 ft) with a reservoir area of 23 km2 (8.9 mi2) with a storage volume of 0.505 km3 (409,000 ac·ft). Though it provides irrigation to 61630 ha for paddy and upland crops, it has aggravated the salinity ingress into the wetland and the river due to reduced outflows during summer months. Temperatures recorded in the area are a maximum of 27.5 °C (81.5 °F) and a minimum of 25.5 °C (77.9 °F)[dubious – discuss]. The climate is hot and humid during April–May while cool during December–January. Ashtamudi Estuary has mangroves Avicennia officinalis, Brugiera gymnorrhiza and Sonneratia caseolaris as also 43 species of marshy and mangrove associates including two endangered species Syzygium travancoricum (endangered species according to the Red Data Book of Indian Plants) and Calamus rotang in the Terrestrial system. These species offer excellent scope for development of marine bioreserve to promote eco-tourism in the estuarine of the lake. IUCN lists the two endangered species in IUCN 2008. The total number of Syzygium travancoricum is reported to be very small, not more than 200. The major threats to the endangered species are reportedly draining of the wet lands and conversion into paddy fields. The lake supports 57 species of avifauna, of which 6 are migratory and 51 resident species. It is also reported that about 40 species of wetland-dependent birds are recorded in the lake, out of which 45% are long-distance migrants. Terns, plovers, cormorants, and herons are most abundant birds in the lake. A study report has identified 45 insect species, including 26 species of butterfly, 5 odonates, 9 hymenopteras, and 2 orthopterans, 1 hemipteran and 2 coleopterans. About 29 zooplankton species have also been identified. The water body is found to have 9 phytoplanktons such as Amphora, Borosigma, Cyclotella, Cymbella, Gyrozigma, Meloziva, Navicula and Nitzschi. 97 species of fish (42 are typically marine, 3 estuarine, 9 estuarine-riverine, 15 marine-estuarine) and unique copepod species. It is also a congenial habitat for all species of penaeid and palaemonid Prawns, edible crabs, paphia malabarica (short neck Clams) and a variety of fish. A comparative shell morphology study of short-neck clam Paphia malabarica, the main clam fishery resources in the Ashtamudi Lake re-assigned to the genus Marcia recens (Venus Clams) and this study found it was wrongly identified as short-neck clam in previous studies. Clams found in the estuary are exported. The estuary is the source of livelihood for thousands of fishermen and is stated to be the second biggest fish-landing centre after the Vembanad estuary. 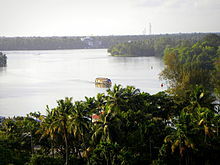 Munroe Island (Munroethuruth) is a cluster of eight tiny islands in Ashtamudi Lake. Chavara South, a small village, an island within the Ashtamudi Lake, located 14 km (8.7 mi) away from Quilon on the National Highway NH 47, is reported to be mineral rich with number of factories for extraction and export of titanium and other minerals. Effluent from the factories is reported to be causing pollution of the lake waters. Thekkumbhagom island, situated on the bank of the Ashtamudi Lake, provides the feel of rustic life of a village. [tone] The significance of this village is due the fact that the first epic poetry in the Malayalam language, Ramachandravilasam, was composed by the poet Azhakath Padmanabha Kurup in this village. An ancient 1000-year-old temple and a 200-year-old church are located here. An evaluation of the marketed use benefits of Ashtamudi estuary (valued using market valuation approach) has assessed the total direct use value at Rs.66.8 million per annum; coconut husk retting accounts for Rs.5.1 million, Inland navigation service accounts for Rs.3.7 million and the recreation benefit is assessed at Rs.1.5 million (using the standard travel cost method). But this is reported to be showing a downward trend, particularly in fish resources in the estuary. This evaluation provides an insight into the economic importance of conserving Ashtamudi estuary. Oil spills from thousands of fishing boats and from industries in the surrounding area. Large quantities of untreated sewage, disposal of human excreta, and the pollution from paper mills, industries (aluminum, ceramics, seafood), as well as from coconut husk retting. whether the lake would have to be soon rechristened "Sapthamudi" or the lake with seven locks of hair. a) "Karimeen" (pearl spot) and "kanambu" (mullet) fish varieties once the livelihood of fishermen have disappeared and resulting in the migration of the fishermen to Paravur and Varkala in the south and even Kannur in the north. b) People dependent on coir for a livelihood used the lake to soak husks but now the Kanjiracode coir industry is non-existent due to closure of the creek resulting in migration of coir workers to other places for a living. Better sanitation, reduction of industrial growth and reduction of urban waste to ensure the maintainable water quality of the estuary. Neendakara port to be provided with improved sanitation facilities, enhanced boat-fuelling terminals and drainage terminals. The above activities have been suggested for implementation in the Vellimon Kayal, a relatively unspoiled part of the estuary. With funds provided by the Union Ministry of Environment and Forests, revival of mangrove forests was done which is reported to be partially successful (out of 2,40,000 mangrove saplings planted over a period of two years 30,000 are reported to be surviving). ^ "The List of Wetlands of International Importance" (PDF). The Secretariat of the Convention on Wetlands (Ramsar, Iran, 1971) Rue Mauverney 28, CH-1196 Gland, Switzerland. Archived (PDF) from the original on 2 January 2008. Retrieved 7 January 2008. ^ "Kerala's Ashtamudi lake gets recognition for sustainable clam fishing". The Hindu. 7 November 2014. ISSN 0971-751X. Retrieved 28 January 2016. ^ "Eco-certified Ashtamudi short-neck clam acquires its rightful identity". Pensoft blog. 5 December 2018. Retrieved 20 December 2018. 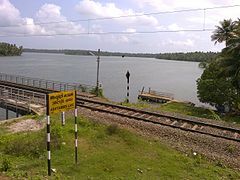 Wikimedia Commons has media related to Ashtamudi Lake.